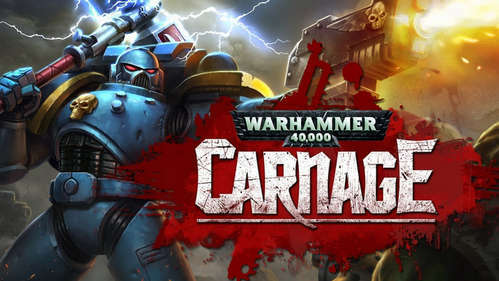 Warhammer games have conquered every gaming console out there, and this time Roadhouse Games has brought the franchise to Android in "Warhammer 40,000 Carnage". This one is a side-scrolling platformer in which you play as a Space Marine smashing hordes of screaming Orks using advanced hammer weapons. This is not an RTS if you're wondering, it's a 2D side-scrolling beat ‘em up instead, filled with gothic futuristic violence. You get 5 space marine chapters/characters to unlock, over 500 Warhammer 40,000 Wargear, and various maps to cause utter destruction and mayhem in. The full version Warhammer 40,000 Carnage v263674 APK free download link in now live. Just install the game and enter the arena to take down anything or anyone in your path. It's honestly one of the best action games ever to be released! You get to customize your space warriors along with their suits, weapons and armor. New equipment makes a huge difference while playing as it gives an advantage over your enemies. With weapons such as Power Axes, Thunder Hammers, Jump Packs, Flamer Weapons, you'll be crushing down those orcs as if they were fleas. And the customized armor will protect you against enemy hits you receive and make you the ultimate war machine! You'll need a pretty powerful device with min screen res of 800x480 and 1GB+ RAM to play with no lags.